The upper Potomac involves every part of the river that is not tidal. That includes all waters from as far north as Cumberland, MD all the way to Little Falls, Washington DC. It holds a variety of fishing opportunities as well as fish species, such as smallmouth bass, carp, sunfish, muskellunge, rock bass, catfish, and now the invasive northern snakehead. Once the Potomac hits action stage, fishing is pretty much done in the river. 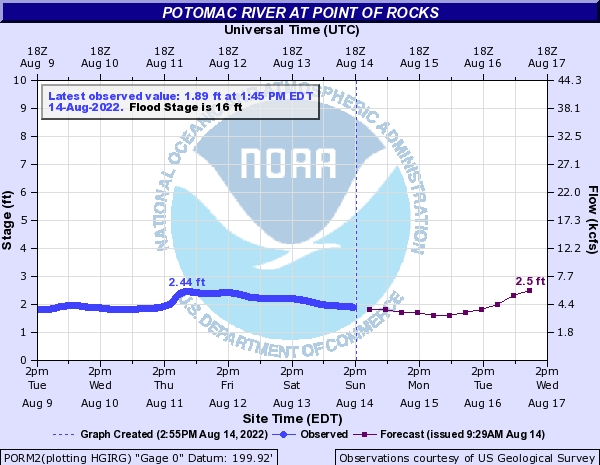 Any sharp upward spike will mean a recent weather event has caused the Potomac to be inundated with water from tributaries like the Shenandoah and Monocacy Rivers, which generally tend to be off color, or muddy in higher waters during these weather events. It has been a very difficult year for fly fishing our local watershed. Presently, I would recommend visiting Shenandoah National Park for brook trout fishing. The higher water has been great for trout fishing.